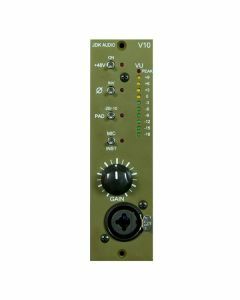 The JDK Audio V10 is a single channel professional grade microphone preamp, designed from the ground up by API Engineers to offer a versatile and high quality input for microphones as well as instruments. The V10 conforms to API's 500 Series format and is a member of API's VPR Alliance. The unit features both a mic and an instrument input, with switchable phantom power, phase, and pad. Metering is a multi-segmented LED with peak indication.